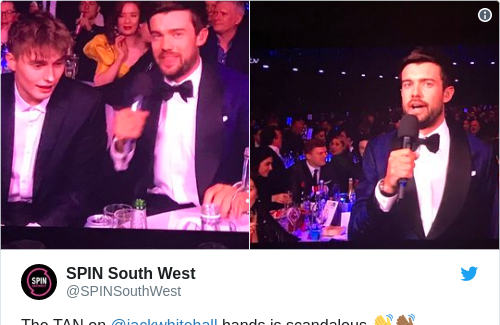 JACK WHITEHALL WAS the host with the most at last night’s BRIT Awards. Well, actually, that’s very much up for debate after a quick look at Twitter. While some were impressed with the funny man, some Brexit-border jokes and comments about Little Mix’s performance left a bad taste in people’s mouth. Did Jack Whitehall really just say that ? “ maybe a hard border with Ireland may not be that bad an idea after all” because Westlife are getting back together! You can make up your own mind as to how he got on. One thing that people can agree on though, is that the tan on his hands was significantly dodgy. Listen, no judgement here – it happens to the best of us, and no doubt there’s a dodgy spray-tanner to blame here.. In the event that Jack wants to go it alone next time though, here’s some tips he should follow for streak-free lámha. An old fluffy/dense face brush that you don’t use in your makeup routine, as you’ll be using it to apply the tan. Whatever tan you’re using, though it’s worth noting that gradual tanner/tanning moisturiser will always apply more evenly. Regular ol’ hand cream/body moisturiser. Spray a small amount of tan on your mitt. Alternatively, if you can reckon you’ve a good bit left over on it from doing your whole body, feel free to use this excess. Add some moisture to where you’ve placed the tan on the mitt. Depending on how sheered out you want the hands on your tan to be, adjust the ratio of products used. I usually find a 7:3/6:4 ratio of tan to moisturiser gives decent colour. Swirl your brush in the products, ensuring a thorough mix. Using swirling motions, apply the mixture to your hands. You can do the same for your feet, if you’re looking to avoid tell-tale tan lines there too. Make sure you wash your brush regularly, as you would a tanning mitt, to avoid streaky applications in the future.